After 20 plus years of art exhibitions, music shows, dance parties, comedy shows and art performances in our gallery, and non-stop art making in our studios, the only building that Space 1026 has ever occupied has been sold. It’s a bit of a mystery how Space 1026 has lasted so long, but it has. This said, we are not part of the new owner’s plans for the building. 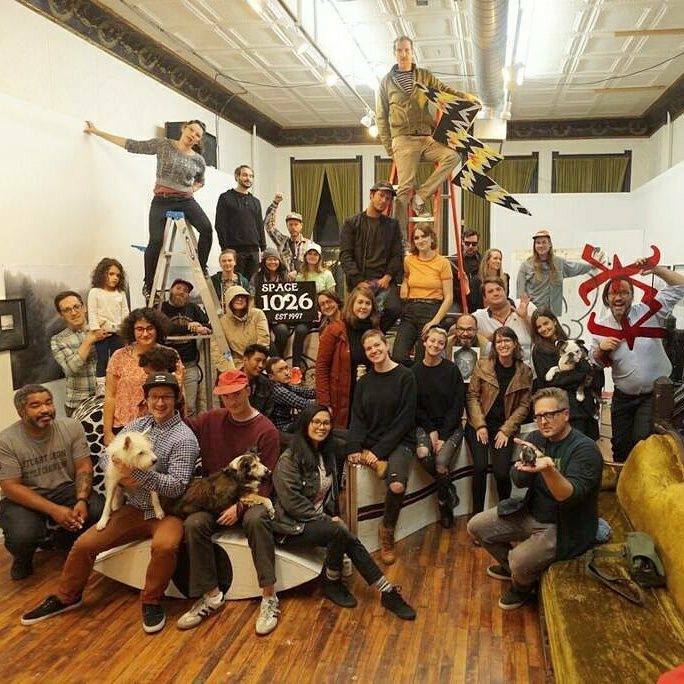 Space 1026 was started as a place to create and show art with people that were actual friends that shared a common vision of “do it yourself, with other people”. We’ve had 10 to 12 art shows a year every year since November 1997. We have shown art by Daniel Johnston, Rebecca Westcott, Cory Arcangel, Ed Templeton, Shepard Fairey, Cynthia Connolly, Jim Houser and hundreds more. We’ve been having performances and parties in our space since February 1998, when the Rhode Island collective Fort Thunder exhibited in our gallery and the duo Lightning Bolt played the opening reception. Kimya Dawson, Bahamadia, Kim Gordon and Ian Svenonius have all played music in our gallery. MF Doom’s album, “Vaudeville Villain” was recorded at Space 1026. Comedian Maria Bamford has performed in our gallery. Whether you’ve donated $5 to see a music show or spent hundreds of dollars at our yearly art auction or exhibited your work in our space or have simply walked into our gallery to view the show, it’s all support and we appreciate it. We have been described as an “art school, without the school”. The Space 1026 alumni list is very long. Clare Rojas, Jayson Musson, Becky Suss, Adam Wallacavage, Isaac Lin, Tara Booth, and Alex Da Corte are just a few people that have made art in our studios. Space 1026 has been the home of some independently owned companies, like Reload Bags, Megawords, All Ages Productions, Free News Projects and The Philadelphia Independent. As an art making collective, Space 1026 has had group shows in London, Puerto Rico, Oakland, New York and many other places. Since 2007, Space 1026 has been home to a Mummers NYB called The Vaudevillains, who help bring rainbow glitter and diversity to the Philadelphia folk tradition. All of this has been made possible by past and present members, friends and supporters of Space 1026. We have been recognized as an art space that is not quite like any other art space in the city or even the country. We have been written about in many publications, some of which no longer exist in print form, like SPIN, and some that do, like The Philadelphia Inquirer. Part of our uniqueness is the architectural structure of the two floors we occupy and the other part relies on the way in which we occupy those two floors. We are not sure what our new space is going to be yet, but we do have plans for the rebirth of Space 1026. We are planning to buy a building that we can count on to be our new home. We will have affordable studios and a screen printing facility like we always have. We will have a gallery and continue with exhibitions and live events and add regular, highly affordable workshops which will be open to the public. Other new aspects that will be a part of the new Space 1026 will depend on the building we find. Artists in residence programs? Expanded printing facilities? Multiple galleries? An area designated for performances? We’ll see. The search has begun. When we started Space 1026 we had to sign a two year lease and that made us nervous, because at that point, we didn’t know what we would want to be doing two years into the future. Twenty years later, with our building being sold, we know what we and the community want, and that is for Space 1026 to continue to exist. We want to stay and serve Philadelphia in a permanent way. Space 1026 is not a registered non-profit and because of this, we have always existed without the help of grant funding. We exist by members paying rent, people buying art, people coming to performances and donations to our art auction. We do not have a surplus of funds waiting around for the ‘rainy day’ that is now upon us. We will need the help of others like never before to secure our future. We are very excited for the new future. Please help if you can. Located on the wall of a boxing gym, Fight Firm. Rowan University Art Gallery at High Street explores built environments, both external and internal, as emblems of a cultural past, present, and future with In/Dwelling: Meditations on Built Environments as Cultural Narrative. The exhibition is on display from February 22 to April 14, with an artist’s lecture and reception on February 25 from 5:00 – 8:00 p.m.
We are compelled to imagine a time when architectural spaces and objects were new representations of manufacturing, design, and aesthetic tastes and trends. The urban / suburban motifs have time and again provided artists with the perfect vehicle in which to explore universal topics such as: the complexity of infrastructure, commerce, demographics, and identity as inspiration to create new work. In this exhibition the participating artists imbue architectural structures and domestic objects with interpretations of historical experiences, social customs, and emotional memories as a cultural narrative. Artists include Philadelphia based artists: Lewis Colburn, Ben Grasso, Kay Healy, Erin Murray, and Miriam Singer. Chicago based artistAnn Toebbe, and New York based artist Brian Tolle. A work by Louise Bourgeois is included courtesy of the gallery permanent collection. The catalyst behind the framing of this exhibition concept was the print Femme Maison, 1984, by Louise Bourgeois from the gallery collection. Femme Maison, which means both “woman-house” and “house-wife,” is one of Louise Bourgeois’s most famous motifs. For the artist, who was raised in France, the home was closely connected to female identity. By combining residential architecture and the curvaceous female body, Bourgeois portrays a woman who is obscured and entrapped by the domestic realm that she simultaneously supports. The selected artists for this exhibition approach domesticity, architecture, and everyday objects from singular and accumulative perspectives. Brian Tolle creates a cross-wiring of reality and fiction in his sculptures and installations and blurs the border between the contemporary and historical with recurring themes of architecture, site, and technology. Lewis Colburn, of Philadelphia, sees objects as unreliable tour guides. He investigates ways in which we re-interpret and re-tell the past through the filter of our current experience. Ben Grasso, of Brooklyn, NY, presents a re-imagining of what actually exists and recasts these things in new terms creating a re-alignment of logic that makes plastic the anxiety underlying objects in the world through his painting. Miriam Singer, looks perceptually at multiple locations in Philadelphia and expresses the fragmentation of a fictional city as a collage of noise, pattern, and density. By recounting memories of unique, collective, or habitual memories these artists investigate identity and history through interior and exterior experiences. Kay Healy, a Philadelphia based artist, creates large-scale screen printed and stuffed fabric furniture based on other people’s descriptions of their childhood homes and investigates how we relate to objects and cope with the fact that there is no way to truly return home. Ann Toebbe, a Chicago based artist, creates meticulous paintings using reconstructed memory and multiple perspectives to depict domestic and architectural spaces in cut-out paper doll fashion. Erin Murray, of Philadelphia, relates to buildings and built forms as being understood to represent our physical body, our cultural history, our economic reality, and our long-formed habits. Brian Tolle, from New York, offers a lecture on February 25. He has completed several public art installations in New York, including the Irish Hunger Memorial in New York City. He has exhibited around the world and his work is included in numerous museum collections. He holds a B.A. in Political Science from SUNY at Albany; a B.F.A. from Parsons the New School for Design, NY; and an M.F.A. from Yale University in New Haven, CT.
Space 1026 is looking for artists to submit 1-3 pieces of 2D visual art that look into the FUTURE. We want to see your loose interpretation of what you think Philadelphia will look like in the year 2076. For example: post apocalyptic nightmares, environmental meltdowns, dreamlike futurescapes, new versions of the same old.